Los Roques is a renowned marine national park in Venezuela. Reeking of spectacular beauty and characteristic charm, there are only a few sights on earth that can mesmerize human eyes the way Los Roques does. Los Roques is also famous as ÔÇÿVenezuelaÔÇÖs MaldivesÔÇÖ as scattered on a massive area, it is a scene straight out of some Hollywood movie. What makes Los Roques the most celebrated destination among tourists is that apart from the ethereal sandy white beaches, awe inspiring greenery and breathtaking sights, it inspires the true notion of a paradise. Tourists speak volumes of it as a vacation making spot because Los Roques offers virtually endless recreational opportunities for the outdoor enthusiasts. 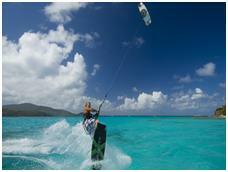 One such activity that tourists engage in Los Roques is kite surfing. A daunting yet exciting feat that gives you a chance to have a birdÔÇÖs eye view of the area, kite surfing is something hundreds of tourists enshrine in their hearts. Kite surfing devotees coming to this area are increasing with each passing day as more and more holiday makers realize the true joy associated to this sport. If you are worried about dragging your kite surfing equipment all the way to Los Roques, you can put all your worries to rest as Los Roques features many kite surfing rentals to ensure each tourist utmost convenience. Vela shop is one such kite surfing rental in Los Roques. Vela shop is located just a short distance away from the biggest island in Los Roques. You can get rented equipment from here at the most affordable prices. Moreover, since it is close to Gran Roque, you can explore all the adjacent islands as well. Vela shop also offers old usable equipment that can be purchased as well. If you are not an experienced kite surfer but are inclined to adopt it as a hobby, you do not necessarily have to buy all that gear costing you a fortune. You can secure all the gear at rock-bottom prices. Are you looking for kite surfing lessons as well? Vela shop is the name. It has some of the best kite surfing instructors you will find in the area. From the honing of your skills as an amateur to the point that kite surfing no longer seems like a feat to you, vela shop strives to elevate your kite surfing experience, taking the excitement to new heights. With kite surfing rentals like vela shop, kite surfing emerges as the most fun filled activity for a budget traveler.